PROS enables turnkey ecommerce solutions for manufacturers, wholesalers, retailers, distributors from small businesses to large corporate enterprises. We have over 15 years of experience in ecommerce technologies and marketing solutions including web, mobile, advertising (Google AdWords & Bing Ads), shopping feeds (Google, Bing, Yahoo), marketplaces (Amazon, eBay, Jet.com, Wal-Mart), analytics, strategy, data science, user behavior and other relevant skills. We have worked with manufacturers, retailers, wholesalers and distributors from small businesses to large corporate enterprises around the globe. We have the ability to scale and customize solutions based on your business requirements from domestic sales to a global audience reaching millions of customers. We have developed a turnkey end-to-end solution that cuts development time by more than 75% saving you time and cost. We can implement new features and functionalities in a matter of days instead of months. Please contact PROS Ecommerce consulting for a FREE consultation or call us today at 619.567.9322. We enable turnkey ecommerce solutions for manufacturers, wholesalers, retailers, distributors from small businesses to large corporate enterprises. Big Data means Big Business! 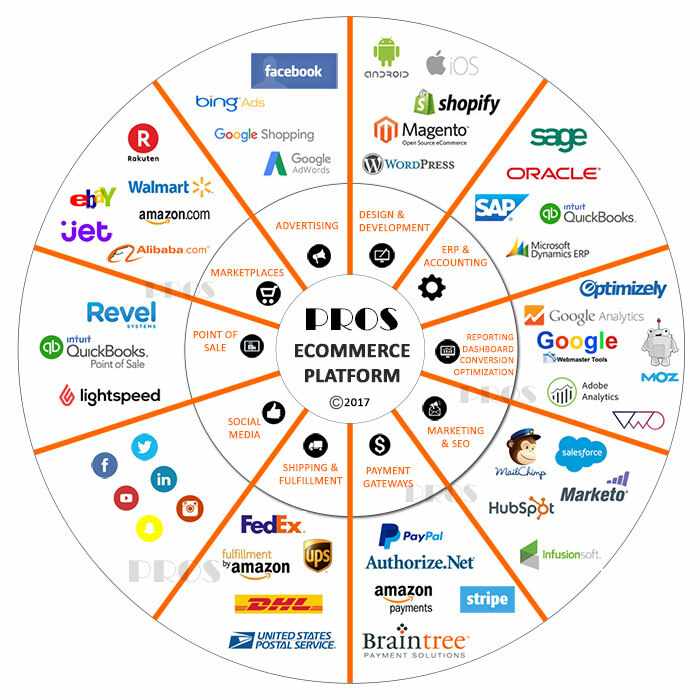 PROS has developed a white label, fully integrated, and complete end-to-end ecommerce platform suited to any vertical. It incorporates multiple sellers (vendors), automated billing between vendors and the website owner, product inventory management, vendor profiles, plus a lot of other features and functions.